One piece kid's costume that includes printed jumpsuit. Available in child's size small, medium, or large. The red and blue Superman jumpsuit is printed to give the effect of muscles. The costume features attached boot tops and cape. 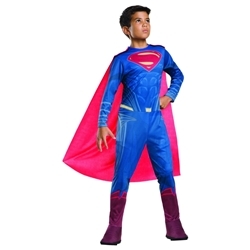 This Superman kids costume is styled after Superman's superhero outfit from the 2016 movie Batman v Superman: Dawn of Justice. In the movie Batman v Superman: Dawn of Justice Superman (Clark Kent) is forced to face off against Batman (Bruce Wayne) after Batman perceives Superman as being a threat to the city of Metropolis after Superman's battle with Zod devastated the city.